Two weeks ago we spent a charming weekend at Sighisoara, the most famous Medieval City, still inhabited, in Romania. We were lucky to find rooms exactly in the middle of the citadel, in the main square, where everything interesting was max 5 minutes away. Sighisoara itself is a gem of interesting buildings and historical grounds, Dracula itself lived here, and you can eat a delicious meal in its very own house. We've visited all the museums, climbed in the Clock tower and up to the Church on the Hill. Yes, those are the exact names of the places, everything here has a practical name. You can walk around School street, eat at the Restaurant Bellow the Citadel and so on. 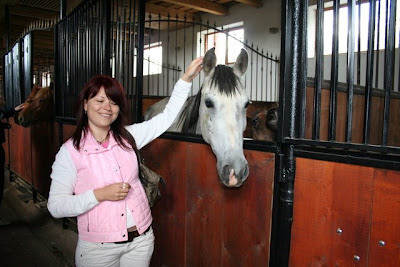 Then we went outside Sighisoara to a horse farm, wanting to ride along the beautiful lands of Ardeal. But we were out of luck, everything was fully booked, so we just walk around the place a little bit, promising to return someday soon.